Note that student dues have been lowered this year, to $15! A hard copy subscription of the Journal of Hymenoptera Research is not included in the dues. All members receive the Society newsletter, Hamuli. 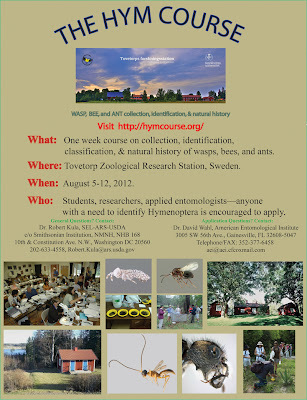 We are pleased to announce the fourth offering of HYM Course (http://hymcourse.org/), scheduled for August 5–12, 2012 at Tovetorp Zoological Research Station, Sweden (http://www.zoologi.su.se/tovetorp/). The main objective of HYM Course is to provide participants with knowledge and experience in identifying parasitic and predatory wasps, sawflies, wood wasps, bees, and ants. Information on natural history is also presented, and that information is reinforced with fieldwork. Techniques used to collect, rear, preserve, and curate specimens are presented in a hands-on manner to allow participants to learn directly by doing. The course is limited to 25 participants. Applications are due March 2, 2012. Students in Sweden are eligible for financial aid through the Swedish Taxonomy Initiative. Please visit the HYM Course website (http://hymcourse.org/) for details, including information on how to apply, costs for taking the course, and logistics of travel to and within Sweden. We look forward to seeing you there! The Executive Committee is pleased to announce the International Society of Hymenopterists (ISH) Endowment Student Award. Please note that this is a different award from the Student Travel Awards, already announced by the Society in November, 2011. Applicants should follow the instructions below, and submit applications electronically to Andy Deans, Secretary, ISH (adeans @ gmail.com). Applications should clearly indicate that they are for the ISH Endowment Student Award. Purpose and value of the award: The Society has created this award to support and encourage predoctoral students working on the systematics, ecology, physiology or some other aspect of the insect order Hymenoptera, which is being undertaken as part of a predoctoral program (normally a PhD or equivalent qualification). They will be advertised on a regular basis through the Society, and an individual award will be valued at US$2,500. These funds can be used for any purpose that makes a contribution to a student’s research such as attendance at a conference, fieldwork, direct research costs or purchase of a piece of equipment. If for travel to a conference, the student also needs to be giving an oral presentation or poster. Deadline and Selection Process: Applications must be emailed to the Secretary of the Society (Andy Deans: adeans @ gmail.com) by February 15, 2012 [UPDATE: deadline has been extended to March 2, 2012], as an attached Word document or PDF . A committee of three senior members of the Society will assess the applications and select the winner. The decision of the committee will be final. The winner will be announced by the President of the Society. *For the first competition, the Society particularly wishes to encourage applications from students who are resident in any country OTHER THAN THE 30 MOST DEVELOPED COUNTRIES as listed by the UN Development Program: Australia, Austria, Belgium, Brunei, Canada, Cyprus, Denmark, Finland, France, Germany, Greece, Hong Kong, Iceland, Ireland, Israel, Italy, Japan, Kuwait, Luxembourg, Netherlands, New Zealand, Norway, Singapore, Slovenia, South Korea, Spain, Sweden, Switzerland, United Kingdom, and United States.